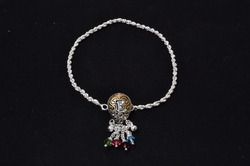 Our range of products include dc silver fancy payal and silver pendal payal. 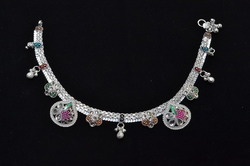 Supported by skilled workers, we are indulged in offering a broad collection of DC Silver Fancy Payal. We are determined to provide superior quality Pendal Payal. Our offered payal is marvelously designed by our knowledgeable designers by utilizing pure and finest quality raw material. Suitable to be worn with traditional and modern dresses, it has gained enormous demand in the market. It is available in diverse designs, patterns and sizes to choose from. Moreover, we provide this payal to our appreciated clients at market leading prices in exceptional packing options. We have emerged as the foremost manufacturer and supplier of DC fancy payal. Our offered range of DC Fancy Payal is available in varied sizes and designs. This payal is designed keeping in mind the present trend of the market. Further, we provide this payal in unlike designs and patterns to meet individual needs of the clients. Clients can avail from us this payal at industry leading prices within stipulated time-frame.